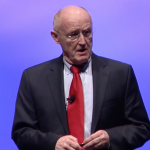 Dr. Dee Edington speaks on health as a serious economic, business, and individual strategy. He starts off by describing an ideal high performing organization and best place to work. He discusses an ideal high-performing organization, the strategies and failures of America’s healthcare system and provides a vision and new strategies for the 21st century. He utilizes the “Four S’s” for characteristics of a champion organization of health and health well-being as well as providing information and vision on the three key learning strategies for transformation. You’ll learn how to create your own successful strategies for building a high-performing health and wellness organization that can be implemented in your own practice or within any large organization. Director of the University of Michigan Health Management Research Center, Dee W. Edington, Ph.D. is also a professor and research scientist at the University of Michigan. Trained in mathematics, kinesiology, and biochemistry, he received his B.S. and Ph.D. degrees from Michigan State University and completed his M.S. at Florida State University. Dr. Edington’s writing, teaching, and research focus on the healthy lifestyles, vitality, and quality of life for both individuals and organizations. He is specifically interested in how individual health promotion, worksite wellness activities, and programs within organizations impact health care cost containment, productivity, and human resource development.